Bring out a deck of cards and you have instant fun! Kids and adults love playing cards. I’ve collected four card games that will help students practice a few basic math skills. Salute is a game I saw described on the internet many years ago. It practices multiplication or addition facts. I love it because the kids are told the sum or the product and then have to think of the addends or factors. Ten Speed is adapted from a card game I had years ago in my classroom. It gets kids to think about the pairs of numbers that add up to ten, such a great skill that helps with the addition and subtraction of larger numbers. High Five is another original game. Students make pairs of five. The pair is two cards that either add or subtract to equal five. Great practice for beginning addition and subtraction facts. Freebie! Directions for four math card games. 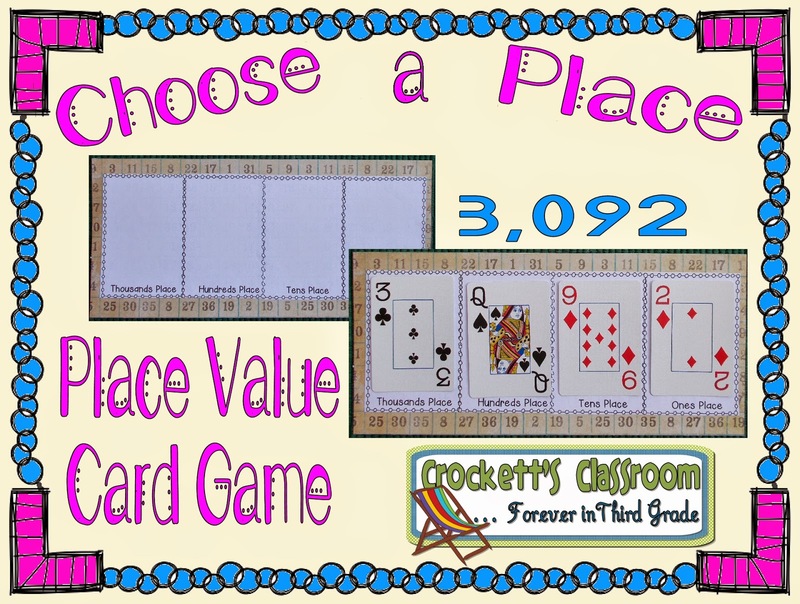 Choose a Place is one I made up to practice place value concepts. It can be played with 2, 3, or 4 digit numbers. (You could play with larger numbers, but you’d have to make your own digit charts.) Basically, students take turns drawing a card from the stack and placing it on one of the digit charts, either their own, or another player’s chart. Strategy and a little luck come into play as students try to build a large number for themselves and smaller numbers for opposing players.